Posted on 13/06/2013 by Jayson	in Markets Comments and tagged STI, support. If you look at the 1 year channel, the index doesn’t look good as it has broke down the lower channel resistance line. A longer downtrend may loom ahead. 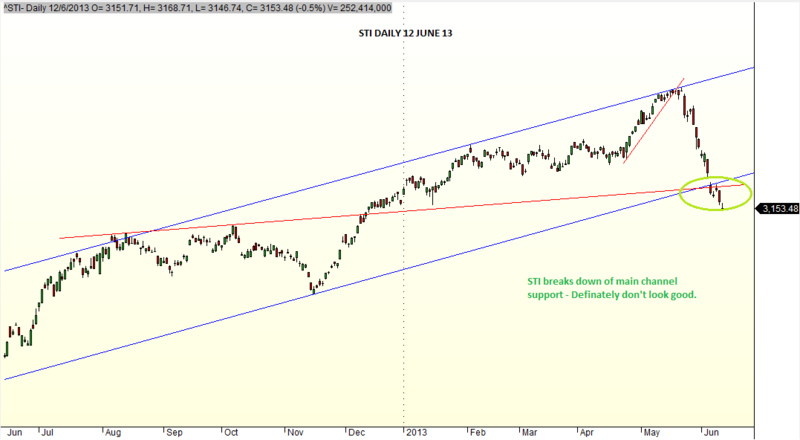 STI has broken its strong support of 3,140 – 3,150. As at 2.30pm, the index was at 3,107. The next support is the psychological support at 3,000. Posted on 23/03/2013 by Jayson	in Uncategorized and tagged consolidation, DJI, HSI, reistance, SGX, STI, support. 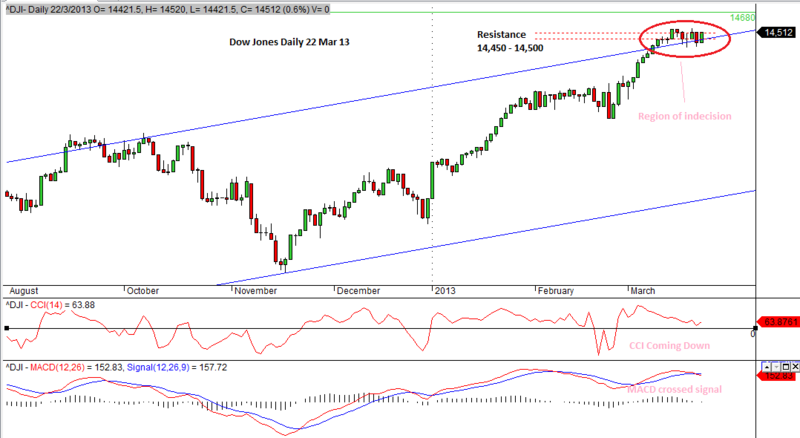 Dow Jones has met with bulls and bears fighting with indecision for the past one week. Resistance level of 14,450 – 14,500 still holds and it has demostrated how nicely the candles stick to the levels verifying the resistance zone which was first predicted on 8 Mar 13 in my earlier postings. 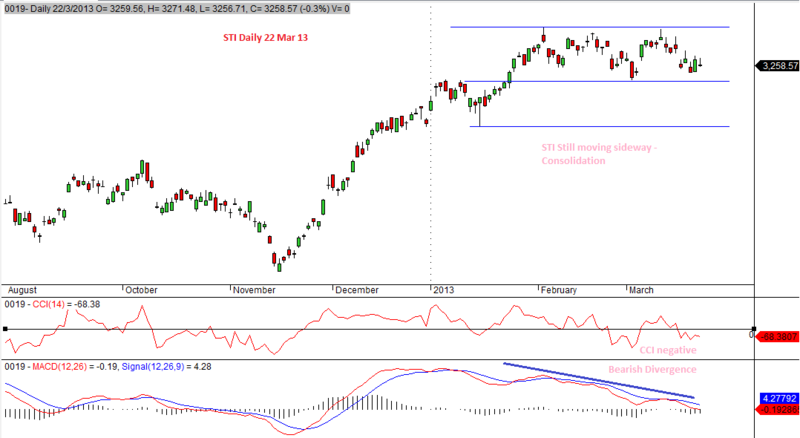 The CCI is coming down and MACD has crossed finally (lagging). In view of the tough fight between the bulls and bears, we need to wait for candles that shows distinctly whether it breaks out of resistance zone or retrace below it. Hang Seng was performing badly. 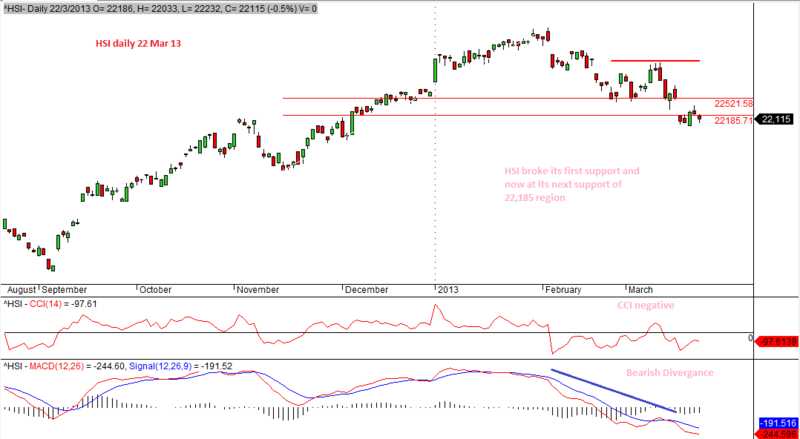 As forcasted last week, it has broken down its previous support and is currently at its next support of 22,185. These two supports were pinpointed accurately. I foresee further downside for HSI in the coming week. 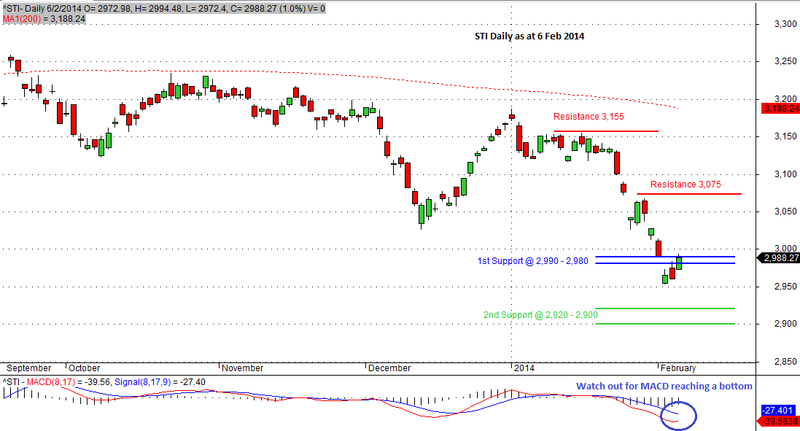 STI is still consolidating sideways and has been so for the past few weeks. It is bounded by resistance of 3,320 and support of 3,230. Bearish divergance still maintained and its direction will only be known when it either breaks the resistance of 3,320 or support of 3,230. Posted on 12/12/2012 by Jayson	in Uncategorized and tagged Kepland, Olam, profit, retracement, support, trader. 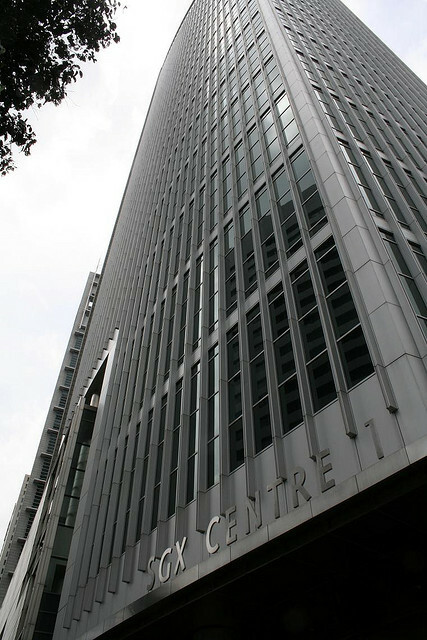 Kepland exhibited a marvelous rebound, upon hitting support of 3.27. It is now at its resistance of 3.85. Cautious traders can take some profit or tighten their stop while waiting to see how the counter is going to react. The candle of 12 Dec 12 looks strong and steady. It is likely that price will break that resistance before have a pull back. On the extreme, Olam seems to stablised at its current price after so much talks in the media. Nontheless, there is a stronger support at 1.35.